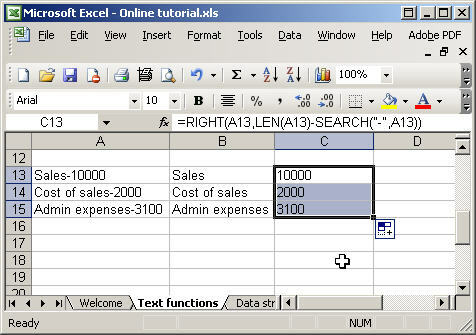 Excel's Indirect function allows the creation of a formula by referring to the contents of a cell, rather than the cell reference itself. 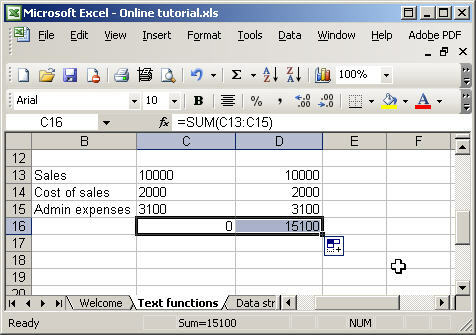 Of all the functions covered in our Excel courses, it is often Indirect() that attendees haven't come across but find an immediate use for, often saving a great deal of time and effort in the process. If you have several sheets, each with information for a single department for example, you may want to set up a summary sheet. Rather than creating separate formulae to refer to each sheet, Indirect() can allow you to create a single set of formulae all of which use a reference to a sheet name held in a cell - hopefully an example will make this clearer. However, sometimes it would be useful to be able to change a whole series of references to, for example, a different sheet. We could type the sheet name into a cell on our main sheet, say A1. We could then write a formula to refer to cell A2 on the sheet typed into cell A1. Excel, not unreasonably, looks for a sheet named A1 and fails to find it.
"'" & $A$1 & "'!A2"
Our Ref_text entry is a little confusing, so we have highlighted the pairs of speech marks in different colours. We have two items of text, and sandwiched in between them, an absolute reference to the contents of cell A1 - as you can see this correctly returns the contents of that cell - Cuddly toys. The ampersands are used to join the 3 elements of our Ref_Text together. The first text section simply holds a single apostrophe - this is necessary because, if our sheet name contains a space, it must be surrounded by apostrophes to be correctly identified. The second section contains an absolute reference to cell A1 - the cell where we type the name of our sheet. 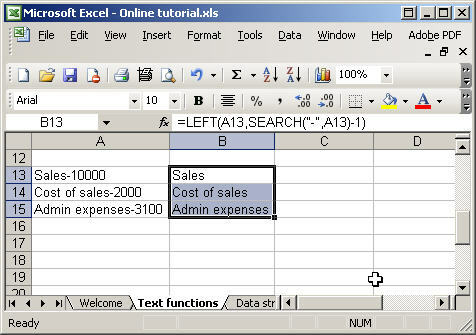 The third text section contains the closing apostrophe for the sheet name, together with the exclamation mark that separates sheet name from cell reference, and the cell reference itself - A2. This works well to return the contents of cell A2 on our cuddly toys sheet, and if we were to type in 'Boardgames' for example, it would automatically return the contents of cell A2 on a sheet named 'Boardgames'.
"'" & $A$1 & "'!RC"
Note that we have to set the 'A1' argument of the function to 'False' to use this reference. RC will return the current row and column - so a formula in cell A2 will refer to A2 on cuddly toys, A3 to A3 and so on. If we need to refer to a different cell we would add numbers in square brackets after R and C. So RC would look at the cell one row down and one column right for example. This is the first part of a two part article that was prompted by a comparatively simple query about concatenating text. 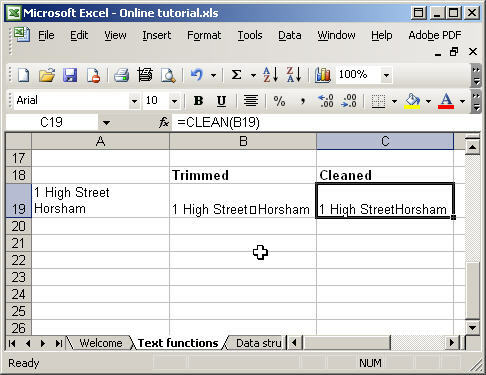 As well as dealing with that query, we'll look at some of the simpler Excel text functions for working with text. Part 2 will follow shortly and, in it, I'll look at some slightly more advanced functions for dealing with less predictable text entries. 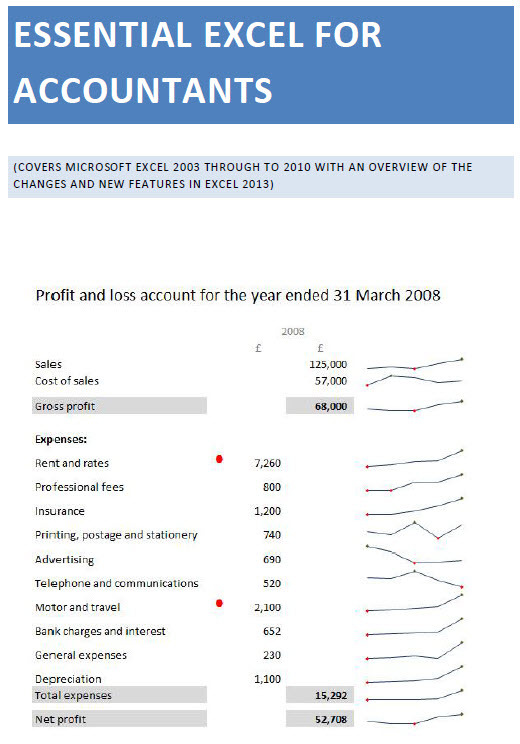 Alternatively, there is an Excel function that concatenates text in this way. Unsurprisingly it is the 'Concatenate' function. 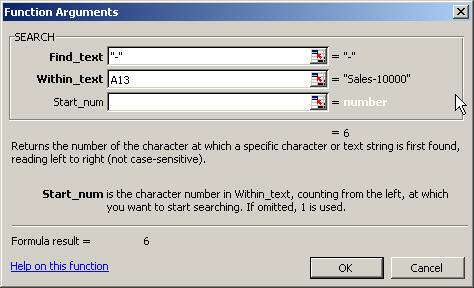 Note that we have included a space after the 'is' and before the â€œ so that the number does not follow on immediately from the text. This group of functions can be used to return specific sets of characters from a text string. As you would imagine, Left is used to return a certain number of characters from the beginning of a text string, Right is used to return characters from the end and Mid to return characters from anywhere within the text string.